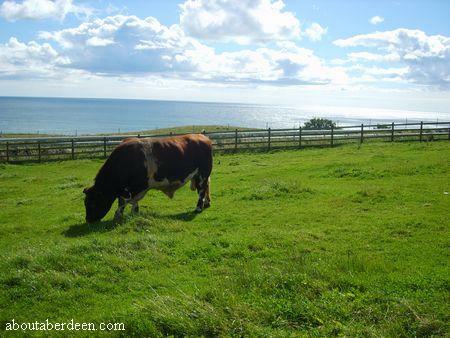 Doonies Farm Aberdeen is a rare breeds farm at the village of Cove just outside Torry, Aberdeen, Scotland. 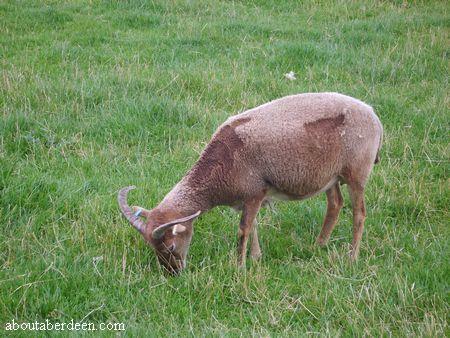 Doonies Farm is the home to the largest collection of rare breeds of sheep, goats and cows within Scotland and works with the Rare Breed Survival Trust (RBST) to preserve many rare breeds such as the White Park cow and bull. Doonies Farm in Aberdeen breed their livestock to either keep at the farm or sell throughout the United Kingdom so that farmers can continue to breed from the rare stock. 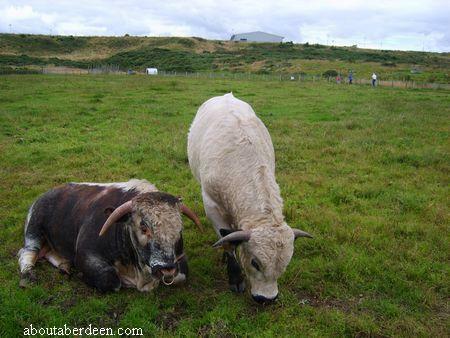 There are about 17 rare breeds at Doonies Farm Aberdeen and this also includes the Tamworth Boar, Norfolk Horn sheep, Golden Guernsey goat, Eriskay pony and bulls and Whiteface Woodland Rams. 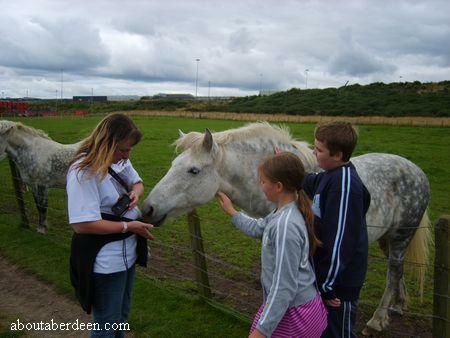 The animals are mostly friendly and enjoy the company of adults and well behaved kids. 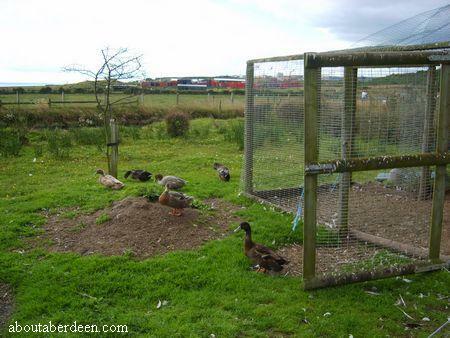 Other animals includ poultry and birds like hens, cockerels, chickens and ducks. 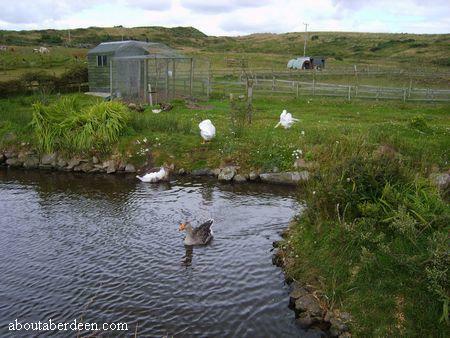 Doonies Farm Aberdeen is now a family businsess run by by Mr G. Lennox both as a working farm and an animal tourist attraction.  Admission costs only: Adult �4, child �2.50 and a family ticket (2 adults, 2 children) just �10.Children aged under 2 years can get free admission to Doonies Farm. 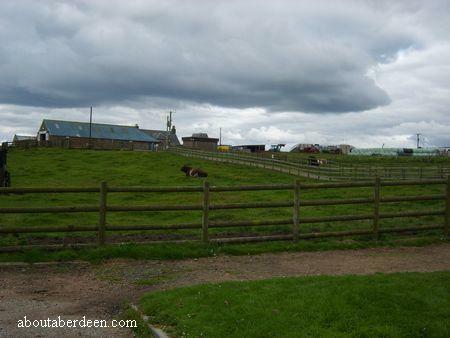 Facilities at Doonies Farm Aberdeen include a free car park conveniently located next to the farm buildings and is suitable for disabled visitors. 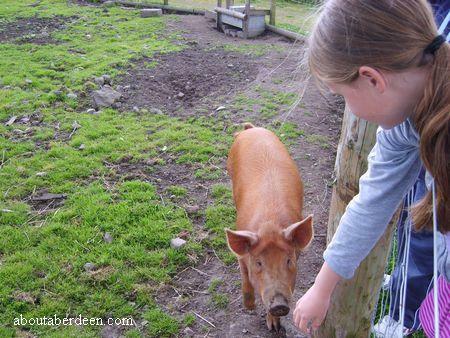 Due to health and safety regulations Doonies Farm Aberdeen cannot let visitors eat or drink within the farm but do supply picnic tables on a site out of the farm where eating and drinking is welcome. The Nigg area affords great views of the cliffs and North Sea. Wheelchair users and those pushing buggies or prams can make their way round most of Doonies Farm which has marked out paths though these can get water logged in really heavy wet weather. There are toilets and disabled toilets. There is no guide book for Doonies Farm Nigg but there is a small leaflet for Doonies Farm. There are no catering facilities at Doonies Farm but packed meals are welcome to be eaten at the picnic area and there is a children's play within the farm. 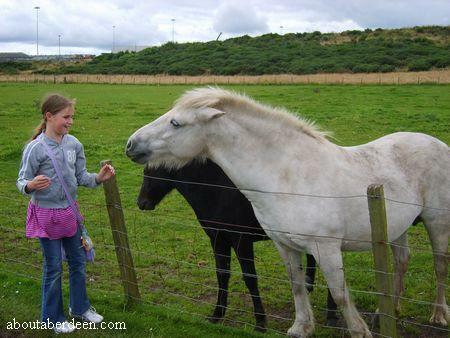 Visitors are encouraged to feed the animals such as the horses, sheep, goats and cattles but are asked to only give the animals at Doonies Farm fruit or vegetables. Visitors are asked to wash their hands after their visit to Doonies Farm. Guide dogs are allowed into the Doonies Farm Aberdeen. 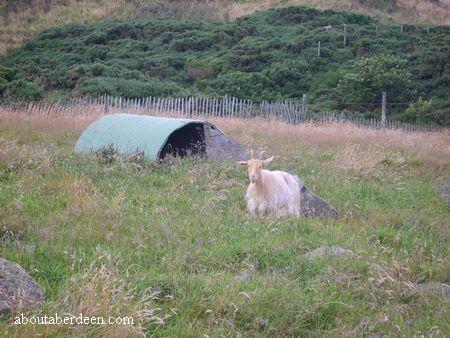 How to get to Doonies Farm Aberdeen - It is found between Nigg and Cove on the old coast road. Directions from Aberdeen City centre is to go down Market Street and stay straight ahead until you cross the cobbled Queen Elizabeth II Bridge into Torry. Take the first left and then at the end of the road turn right then left and then right by the golf course. Follow the old coastal road and Doonies Farm is signposted to the right. 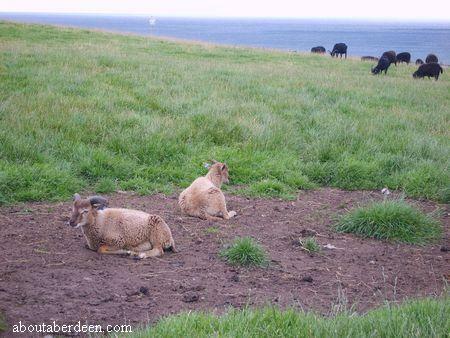 The opening times for Doonies Farm Aberdeen are 10am - 5pm summer. Winter opening times are weekends only from 10am to 5pm, then as of the end of February 2011 Doonies Farm shall be opening 7 days a week. If there is severe snow and ice then for health and safety reasons Doonies Farm Aberdeen will close to the public for their own safety. 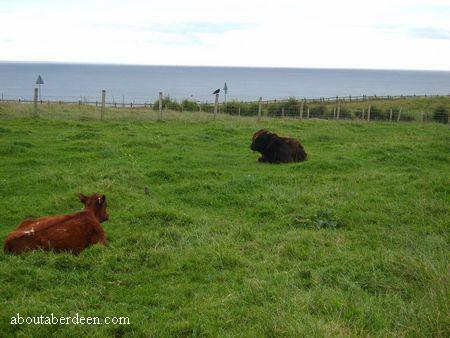 The Directors of Doonies Farm Aberdeen are Graham and Debbie Lennox. Sadly the Christmas Nativity at Doonies Farm for 2010 was cancelled for safety reasons due to the ice and snow. 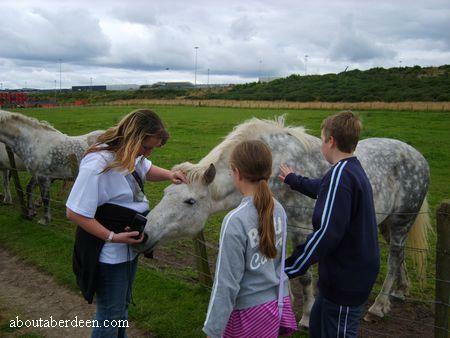 Please visit www.dooniesfarmaberdeen.co.uk for details of other events at Doonies Farm Aberdeen. On Sunday 14 December 2008 Doonies farm Aberdeen held what it hoped to be a new annual event. This was a live nativity play with the animals of Doonies Farm taking part including lambs, a donkey and calves. 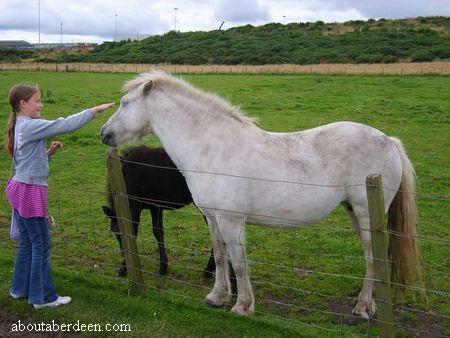 The 2008 live nativity play donkey was Lottie from Hazlehead Park Pets Corner. Santa and his elf helpers took part. Easter Eggstravaganza event at Doonies Farm Aberdeen on the 11th and 12th of April 2009. Everybody is welcome to come to Doonies Farm to roll their Easter eggs and prizes will be given for the best decorated egg. Either bring your own egg or decorate one of the Doonies eggs! If you're feeling creative you can make an Easter Bonnet too. The lambs have started arriving, along with some calves and Doonies will soon have chicks from their new incubator! 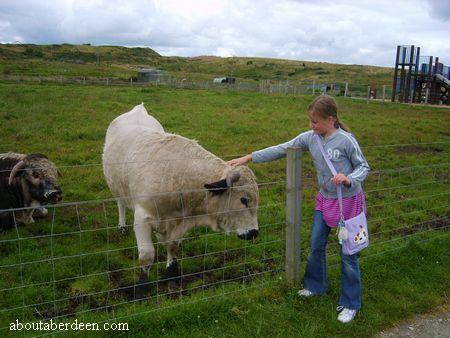 The fun Easter event at Doonies Farm Aberdeen starts at 12pm and finishes at 4pm on both Saturday and Sunday. 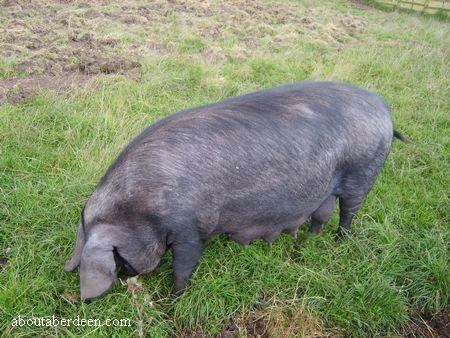 The following photos of Large Black Pigs and Large Black Piglets were taken in 2007 and are for general interest, these animals are no longer at Doonies Farm Aberdeen. The information below regarding the story of how Doonies Farm Nigg was saved is included for historical interest. Doonies Farm is now run by the former manager, now director, Graham Lennox and his wife Debbie Lennox after two years of negotiations. 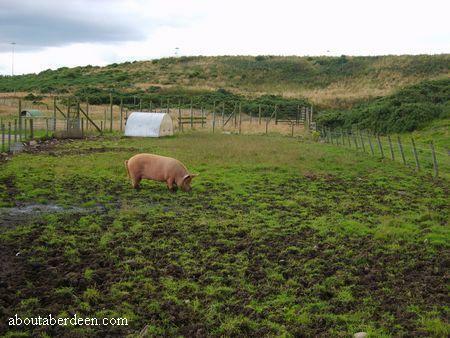 On the 1 August 2008 Aberdeen City Council voted unanimously to allow the Save Doonies Farm Group - Friends of Doonies - to run the farm for a trial six month period. 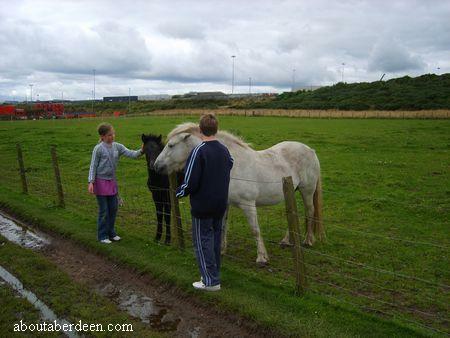 Sadly Aberdeen City Council announced the Doonies Farm closure in February 2008. It still remains open whilst homes are found for the rare breeds but will close on the 1 April 2008. Many local companies are helping Doonies Farm and the Save Doonies group whilst charity status is organised. 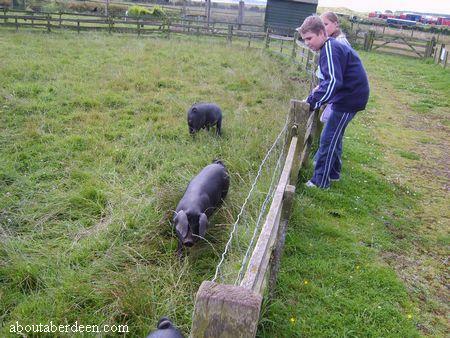 For example the Sainsbury's supermarket in Garthdee donated spoiled fruit and vegetables for the pigs to eat to help Doonies Farm save on their feeding costs. 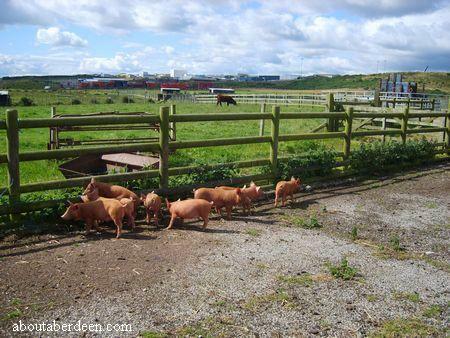 During the May Bank Holiday there was a Doonies Farm animals sale were money from the sale of 60 lots of pigs, poultry and sheep was given to Doonies Farm. The bidding took place at Aberdeen and Northern Marts biannual rare breeds sale at Thainstone Centre, Inverurie. There is an online Doonies Farm Aberdeen petition at the gopetition website which went live in March 08 and within a few days the Doonies Farm petition already attracted over 1000 signatures. Visit and sign the Save Doonies Farm petition at www.gopetition.com/petitions/save-doonies-farm.html or type Save Doonies Farm into your search engine. In addition there is a public meeting about the closing of Doonies Farm Nigg at the Thistle Hotel in Altens, Aberdeen on Thursday the 13 March 2008 at 7:30pm. On Saturday 5 April 08 many Aberdonians and Save Doonies campaigners will march down Union Street in Aberdeen City during the Aberdeen Against the Cuts rally. Supporters of Doonies will wear fancy dress animal costumes. 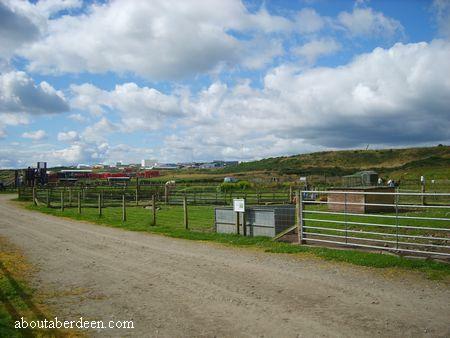 Though Doonies Farm Nigg was due to be closed on the 1 April 2008 it was kept open for another 60 days to allow campaigners to present a business plan to Aberdeen Council. 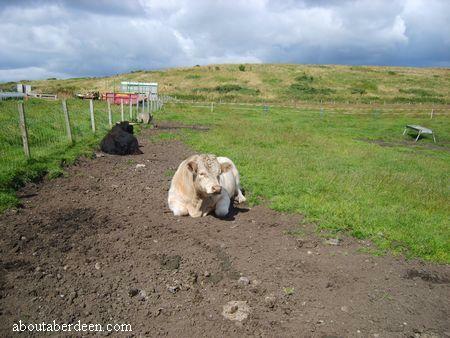 Below is the old Doonies Farm Aberdeen logo from the Friends of Doonies charity which AboutAberdeen think closed in 2010 when Doonies Farm Aberdeen was taken over by the Directors Graham and Debbie Lennox. www.dooniesfarm.co.uk was the url for The Friends of Doonies Farm Aberdeen.